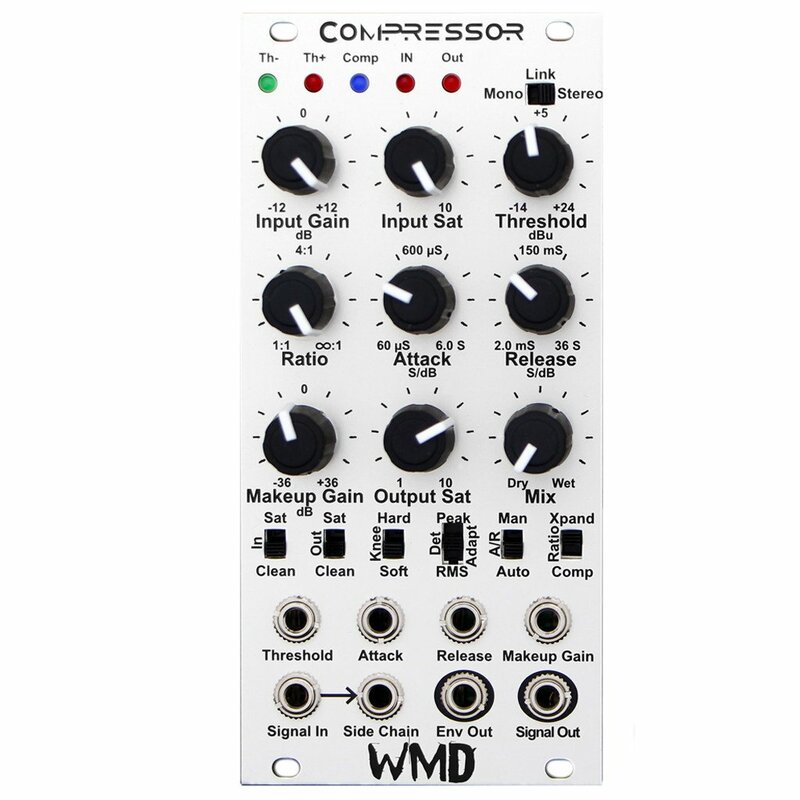 The WMD Compressor is a feed-forward design where the input signal is analyzed to determine how much compression is necessary. This architecture is powerful and fast and offers plenty of control over the compression control signal. The signal path is short, consisting of an input gain stage, the compressor VCA stage and then the final output mix stage. The input stage uses a TLE2027 ultra low noise and low offset opamp. The VCA and output mix use OPA1641 low noise high-headroom opamps. The maximum output swing is close to the supply rails at 22Vpp. The Manual Attack/Release circuitry is based on principles designed into the Multimode Envelope. It is incredibly fast and can range to a near stop. This allows you to use the envelope as an effect, and use the CV to halt compression if desired. Too fast of both Attack and Release times will introduce distortion as the follower attempts to follow the signal itself rather than the envelope of the signal. 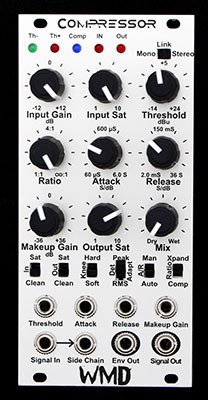 The Side Chain lets you use another signal to control compression of the input. This lets you duck a bass sound for the kick, or duck a mix for voiceover work, or distort a lead when something else is happening. The Side Chain is very useful for adding dynamics to a patch quickly and easily. 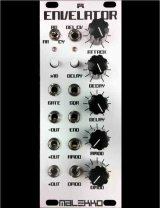 It also lets you use the Compressor to work in feedback mode, where the Compressor controls the input to a filter, and the output of that filter is run through the side chain; then when resonance starts to distort the signal, the input is dropped down to compensate. This allows for very smooth resonant patches. 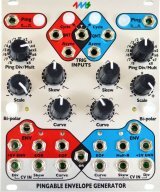 The Input and Output Saturation circuits are voiced differently from each other. The input side saturation works with the input gain control to give a very soft clipping. Lots of 2nd order harmonics to warm your signal here. Input saturation will be present on the Dry side of the Mix control as well as be passed through to the follower and the compression core. Output saturation is active on the Compressor's VCA circuit. It can clip much harder than the input side. Output saturation is great for distorting the initial transient from a slower attack, giving the initial hit more harmonics and a punchy timbre. Link - If you have two WMD compressors, you can link them together with an 1/8” cable on the back. Flipping each Compressor’s Link switch to Stereo will connect the two detectors together for true stereo bus compression. Knobs must be set the same for both channels to truly behave the same, as only the detector information is shared.